CELT received a $4.4 million grant from the Leona M. and Harry B. Helmsley Charitable Trust to develop and promote teaching practices that help undergraduate engineering students reflect on their educational experiences. The award established the Consortium to Promote Reflection in Engineering Education (CPREE). This NSF-funded project seeks to shed light on past change efforts in engineering education in order to facilitate continuing transformation in the field. One primary project activity was to interview “pioneers” or successful leaders and change agents in engineering education, with emphasis on the earlier generations of pioneers. A group of graduate students interested in engineering education conducted the interviews and authored the pioneer profiles published on the Pioneers web site. 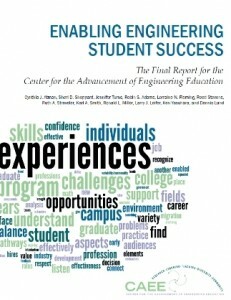 CELT had the lead role in the Center for the Advancement of Engineering Education (CAEE). Begun in 2003, CAEE is a multi-institution, multi-method research center with $12 million in funding from the National Science Foundation (NSF). CAEE conducted research into undergraduate engineering learning, faculty teaching, the use of portfolios in preparing graduate students for teaching careers, and building capacity in engineering education research. CAEE’s final report, along with many other resources, are available for download on the CAEE web site. Instructional services previously offered by CELT are now available through ET&L, the College of Engineering’s Office for the Advancement of Engineering Teaching & Learning, directed by Jim Borgford-Parnell. Please see the ET&L web site for more information. The Engineering Education Community Resource wiki was created in 2011 by the American Society for Engineering Education’s Student Division (ASEE SD), in collaboration with CELT, and is co-maintained by CELT staff. The resource primarily consists of links to programs, centers, researchers, societies, publication venues, etc., intended to help in the exploration of engineering and, more broadly, STEM education. CELT’s YouTube channel features keynotes and other presentations made by CELT staff.